I am Crazy about Tomato Soup, I’m always fond of Tomato soup at any time of the year but particularly in winter.. There's nothing like a quick soup that can be filling, comforting and nutritious There are so many versions on how to make tomato soup; this is my version of making tomato soup.. 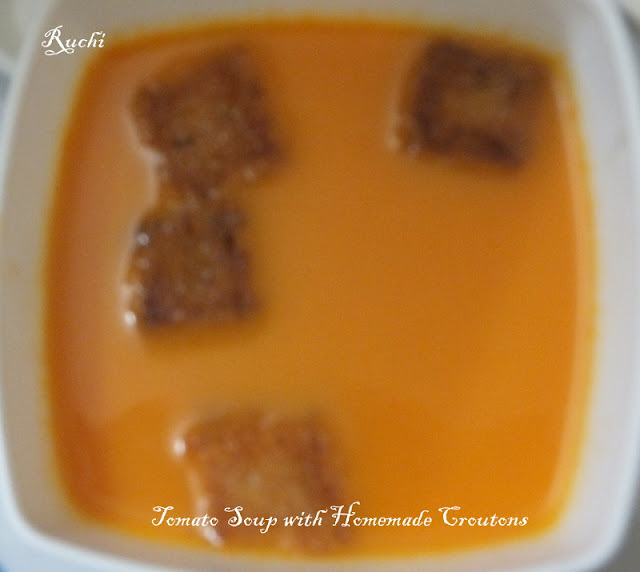 So today's recipe is tomato soup which is one of my favorite and the home made croutons. There is nothing better than hot soup with a few scrumptious croutons floating on top make it extra special! Cut the bread into 3/4 to 1 inch sized cubes. Drizzle the bread cubes with 1-2 tablespoons of melted butter or olive oil. The bread slices will be fried evenly in all sides. tossing to evenly coat. Seasonit with mixed herbs. 1.Wash and chop the tomatoes into chunks. 2.In a deep pan, heat the butter and add the bay leaf. When it begins to sizzle, add the chopped garlic , dalchini and onions. Saute for 2 minutes. 3.Now add the chopped carrots.Cook on medium heat until the carrots are soft. Now add the tomatoes andsmall amount of water cover the pan with a lid. 4.Cook for 5-6 minutes until the tomatoes are cooked and all the veggies are done. Remove the bay leaf and make it cool. 5.Blend the cooled mixture until smooth. Use as little water as possible. I didn’t have to use any. 6.Return the blended soup to the same pan and turn heat to medium. if it feels too thick add little water. It should have a pourable consistency. 7.Add sugar and Season with salt and pepper powder. . Garnish with fried bread croutons and serve hot. *Due to healthy part I didn’t add cream . Love this warm comforting soup.